Bentonville and El Dorado, Arkansas, July 19, 2018: Visit Bentonville and Digital Impact Solutions today announced the launch of one of the first community destination bots in the United States.Jointly designed by the Bentonville Convention and Visitor’s Bureau and Digital Impact Solutions (DIS) and built by DIS co-founder Joe Buhler, the newly launched Facebook Messenger Chatbot will provide the visitor, or consumers considering a trip to Bentonville, Arkansas with just about anything and everything they need to know to have a better experience, in the pre-trip phase as well as “in destination”, and may be used post-trip as a survey and review tool, and to encourage visitors to share with others. The bot has all the most relevant information about the city itself, where to stay, where to dine, area attractions, the brewery scene, biking trails and more.It gives the consumer all the options, including the ability to book a hotel, download a dining guide and more.There is a special section for meeting and event planners with meeting and event venues available in Bentonville. Additional content available via the bot include special events such as the Bentonville Film Festival, Power of Music Festival, the Oz-Trails Off-Road and more to come. 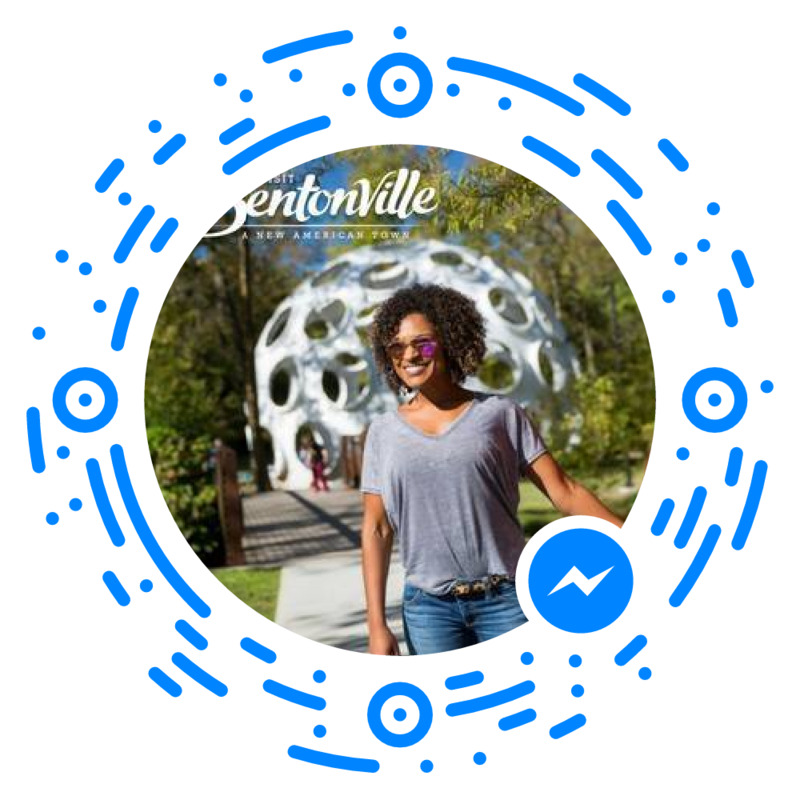 Visit Bentonville is the Bentonville, Arkansas Convention & Visitor’s Bureau brand for marketing the city’s unique character and charm to all visitors. . To launch and engage with the Bentonville Bot, open Facebook Messenger on your iPhone or Android device.Click on your profile photo in the upper left, when the large photo opens, choose Scan Code on the upper right to scan the image below and the bot will be activated! Enjoy the experience!